Touring the country with Australia’s best V8 drivers and working on one of the world’s most prestigious cars ” the Mercedes Benz. This is the life former Ashby resident Luke Mason (23) has made for himself through the V8 Supercars Championship. In a sport where milliseconds can be the difference between winning and losing, Mason’s role as data engineer is crucial. 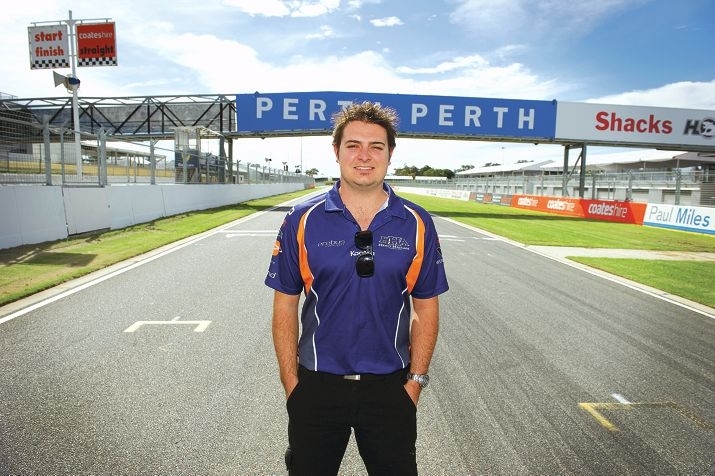 The ECU Bachelor of Technology graduate, who majored in motorsport, studies the in-race performance of driver Tim Slade’s Mercedes E63 AMG V8 Supercar. Headed by Erebus Motorsport, the Mercedes Supercars are the first of their kind in the world. Their luxurious origins speak for themselves ” to buy the road car the E63 Supercars are based on will set you back a cool $240,000. But forget luxury, Mason’s job is to help optimise Slade’s vehicle for speed. ‘I work through with the race engineer, looking at all the data and times we get from the track to work out a way to make him go faster,’ he said. ‘During the actual race itself, I do a lot of the strategy side of things; so any tyre stops or fuel stops we think will benefit us, I’m in charge of all that. Mason ” in his second year as a data engineer ” predicted Barbagallo Raceway would produce Mercedes’ best performance yet in its debut year. The Erebus team had rushed to have the vehicles race-ready for round one of the championship. Heading into round four, the team now had a better idea of how best to run the cars. With his Mercedes connections now set, Mason hopes it can take him to the ultimate in motor racing ” the Formula 1. But life is pretty sweet for now. ‘Being a single man on the Gold Coast working on race cars ” it goes alright,’ he said.